Posted on April 14, 2008 by D.C.
Should you happen to feel your Asus Eee PC isn’t fast enough (at least under Windows XP or Windows Vista), Cyb3rGlitch Tutorials has posted an in-depth guide to three different methods of overclocking your Eee PC (the 7″ version). Note: As they point out, this can void your warranty and potentially cause problems. 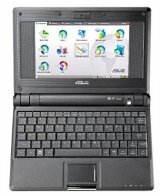 This entry was posted in Articles, ASUS, Netbook. Bookmark the permalink.